On Tuesday Soccer City, the huge football stadium in Soweto (built for the world cup in 2010), was packed to capacity with people of all races and from all walks of life, from the unemployed to superstars and presidents. 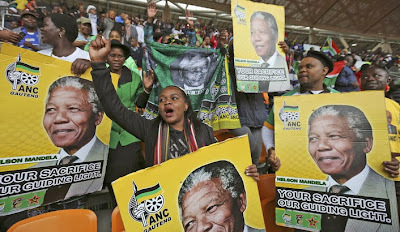 Unusually for Johannesburg in summer, rain settled in and drenched the mourners, many of whom had waited since the early hours of the morning to be sure of a seat. One woman said that even the angels were crying. Still, in Africa rain is always a blessing, which is why the unit of Botswana currency is the Pula, meaning rain. 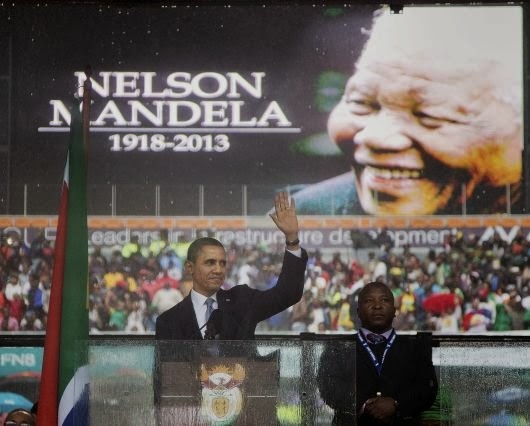 At the memorial, it was Barrack Obama whose speech seemed to best capture Mandela’s life and the mood of the audience. It focused on Mandela’s contribution and what it means for all of us – not only in South Africa but everywhere. It demands that, while we may fall short, we should at least try to emulate his example. If you haven’t already heard President Obama’s speech, and if you are still reading this blog you will want to hear it, you can find it HERE. 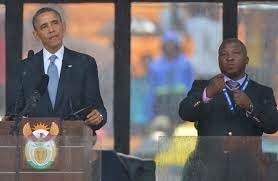 Then there was the embarrassment of the signer who shared the stage at the memorial with the speech makers. He's incomprehensible to deaf sign language users. Apparently the sign for “prawn” occurred frequently in his translation of President Obama’s speech, but nothing made sense. 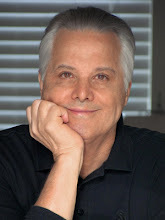 A representative of the deaf community complained that she'd drawn the translator’s incompetence to the attention of the authorities on more than one occasion, but summed up their response rather charmingly by saying that “no one listens to us deaf people.” The fact that he is not merely incompetent but also a self-confessed schizophrenic who claims to have seen angels at the memorial (apparently not crying) and has been accused of fraud and violent acts, suggests that the security was lax to say the least. Thank heavens it all passed off with nothing worse than drenched clothing and a few sniffles. 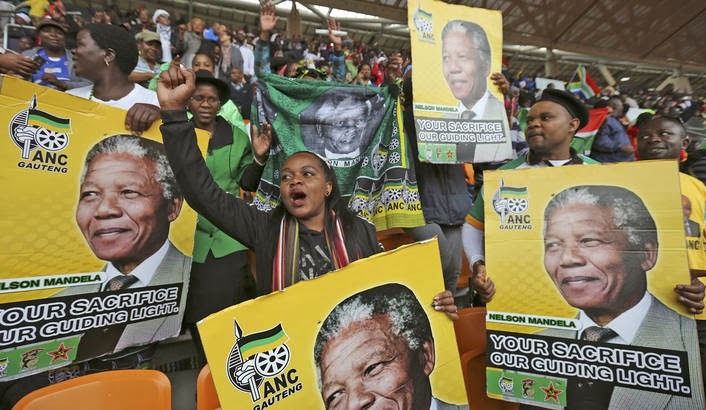 Looking ahead to 2014, South Africa will face its first election without Mandela. The landscape has changed forever. 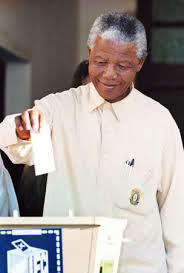 It’s twenty years since the first free elections; the youngest voters next year are “born frees”, people to whom Apartheid and the Struggle are history rather than personal experience. 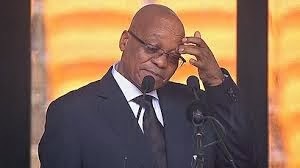 There is no doubt that the ANC will win comfortably, but if its vote drops significantly, Jacob Zuma will be out. That will be none too soon for many people. 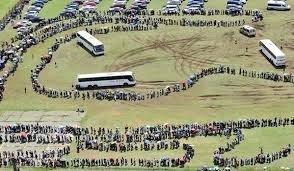 But I hope that Madiba will be at that election after all, watching over long lines of people waiting to vote as they did in 1994, trying to find their way back to the trail he blazed. Since “selfie” is the word of the year, I can’t resist concluding with this cartoon, sent to me by a friend in the US. 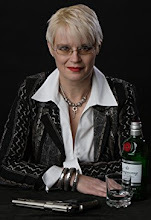 And if one of us had invented a character who posed as a signer in order to get close to various world leaders, but who did not seem capable of producing coherent sign language, our editors would throw a fit! Indeed, Zoe! Of course we would have had him as an expert signer - maybe actually deaf - wielding a plutonium syringe. Well, maybe not. 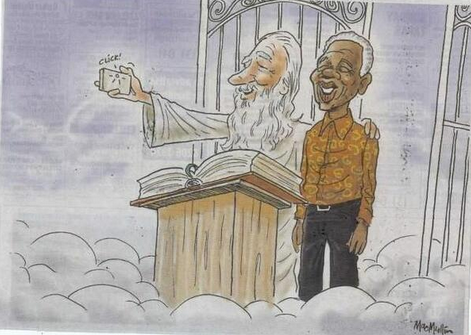 Of all that I've read and heard, I must say that the cartoon made me smile the most, for it said it all! As for the signer, he's probably friends with the party crashing couple at the White House who generated so much ink during POTUS Obama's first term.